No railway lines travelled on in the months of January and February 2015 due to me having a stroke at the beginning of January. I was in hospital for nine days and not able to walk for a week. I have now recovered OK and am back travelling round the country again. 15/3/15 - Leigh-on-Sea to Pitsea and return. My first journey by train for over two months since I had my stroke. Just a short journey from Leigh-on-Sea to Pitsea and return to try out how I feel on public transport, as well as to photograph the new lay out for the junction at Pitsea. 18/3/15 - Leigh-on-Sea to West Ham and return. My first railway journey into London since having my stroke to see Spandau Ballet at the 02. 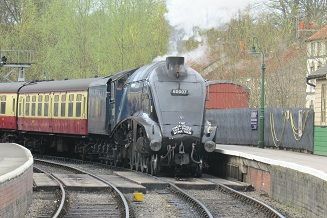 Sir Nigel Gresley arrives at Pickering. Well actually its pushing the carriages out of the station! 1/4/2015 Leigh-on-Sea to London Fenchurch Street and return. Went into London for a business meeting. 11/4/2015 Leigh-on-Sea to West Ham. London Waterloo to Barnes. London Fenchurch Street to Leigh-on-Sea. Went into London see the boat race, followed by seeing Robin Trower at the Shepherds Bush Empire. 15/4/2015 Pickering to Whitby. Whitby to Goathland. Goathland to Pickering. Away in Yorkshire for a few days with my wife. Went for a day trip on the North Yorkshire Moors Railway for the first time in nearly twenty years. It was nice to be able to travel direct through to Whitby where the NYMR have paid for a second platform to be opened at Whitby station. Also was hauled by Sir Nigel Gresley to and from Pickering which was nice. The NYMR is one of my favourite preserved railway lines. Just one gripe though. It would be nice having built such a long platform at Whitby for some seats to have been provided whilst passengers wait for the train to come in. Instead we were all squashed into a small area by the station entrance whilst we waited for the train to disengorge its passengers. I don't know if they do this on busy days, but it would be far safer and nicer if we could spread out along the platform rather than be squashed in such a small space! My second visit to a heritage railway in just over a week. 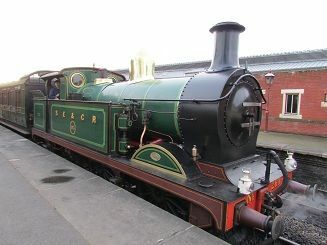 This time to the Epping and Ongar Railway which was celebrating the 150th anniversary of the line. Had a nice day going up and down the line which almost reaches to Epping. They just need a bit more money and the support of Transport For London to join the line back up to the London Underground station at Epping, which would be nice. 8/5/15 - Leigh-on-Sea to London Fenchurch Street. London Euston To Watford High Street. 9/5/15 - Watford Junction to Norwich via Stratford and Ely. Norwich to Ipswich via Felixstowe Docks North. Went away to stay in Watford overnight to go on the Charity Railtours' Four Triangles tour round East Anglia on the saturday. The tour started at Crewe shorlty after 4.00am and I picked it up at Watford Junction just after 7.00am, hence statying overnight in Watford. It meant I was able to go through the short gap between the WCML and the North London line via Primrose Hill. The idea of the tour was to go round the four triangles on the Great Eastern Mainline at Stratford, Ipswich, Norwich and Manningtree, Whilst most of the tour worked as advertised, we weren't able to go into Bow Yard, but we did manage to go into and out of John's Logistics at Eccles Road. The main problem occurred at Norwich where we should have had an hour and quarter break whilst the train was serviced. Howver when we thought that the train was coming from Crown Point to pick us up at 4.15pm it went into a siding and then we waited and waited. Sadly there was no announcement of what was going on and it wasn't until 5.15pm that the train came in with a replacement loco, as one of the 37s had failed. We still did the triangle of Crown Point and went to the new siding at Felixstowe North, but as the train was nearly an hour behind schedule I got off early than planned at Ipswich and missed out the Manningtree North Curve. Apart from this problem it was still a good, well organised tour with great catering from the Frying Scotsman company and alot of hard work from organiser, Dennis Barnes. 18/5/15 - Leigh-on-Sea to West Ham. London Bridge to South Croydon. Wimbledon to London Waterloo. London Fenchurch Street to Leigh-on-Sea. 23/5/15 - Leigh-on-Sea to London Fenchurch Street and return. London Euston to Coventry via Northampton. Coventry to Birmimgham New Street. Birmingham New Street to Watford Junction via Northampton. Watford Junction to Wembley Central. Went up to the West Midlands to Coventry and Birmingham for picture purposes. Then on the way back went to the League 2 play off final at Wembley Stadium between Southend United and Wycombe Wanderers. It was interesting to go via Northampton for a change - a line I hadn't been on since the 1970's. 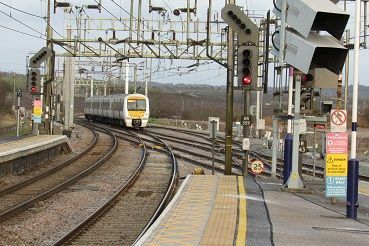 It seemed that all trains were being diverted via Northampton that day because my train waited nearly fifteen minutes there whilst three Virgin Pendelinos came through northwards. Then coming back on a Virgin train we once again came via Northampton. Arriving at Birmingham New Street station, the place is a mess! Going oout into the centre of Birmingham the main entrance is currently closed and you get diverted through the side entrance. Meanwhile on the station itself, I find it to be one of the least welcoming stations on the whole of the UK rail network. There are very few seats for you to sit on whilst waiting for your train. There are no catering or toilet facilities at platform level and everything looks so white or is it grey? with very little in the way of advertising or signeage which would add a bit of colour to the drab view that you get for a mainly underground station. I only hope that all the improvements do actually improve the experience for the average passenger using the station in the future. 2/6/2015 - Leigh-on-Sea to London Fenchurch Street and return. Went up to London for the day for a business meeting. 13/6/2015 - Leigh-on-Sea to West Ham and return. London Bridge to Tunbridge Wells. Tunbridge Wells West to Eridge and return. 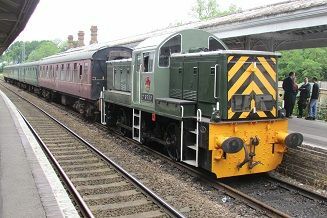 Tunbridge Wells West to Groombridge and return. Tunbridge Wells to Orpington. Orpington to London Bridge. Went for a day trip to visit the Spa Valley Railway which runs from Tunbridge Wells to Eridge. I had been there about ten years ago when it only ran as far as Groombridge, but since then it has been extended to run parallel with the main line from London to Uckfield terminating at Eridge Station. 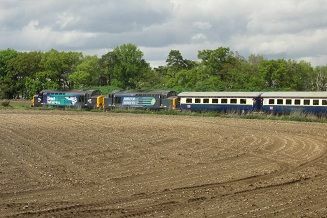 It was some more new track for me, but it was nice to travel in the Kent countryside during the summer. The staff were very friendly and there was a nice buffet on the train, which we used on our second journey. We were pulled by by diesel and steam so everyone was happy. 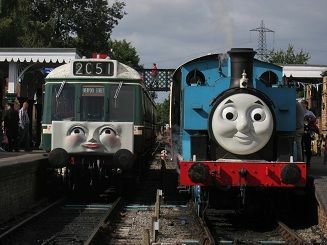 Quite rare for a preserved line as usually it's either one or the other. So well worth a visit if you're ever in the area. 15/6/2015 - Bressingham Steam Museum. Visited this with our grandson who loved seeing a real steam engine for the first time ever. Went on the three different railways there. 26/6/2015 - Leigh-on-Sea to West Ham and return. Went to see Fleetwood Mac at the O2. 4/7/2015 - Rayleigh to London Liverpool Street and return. London Marylebone to Wembley Stadium and return. Went to Wembley Stadium to see AC/DC in concert. Much easier to go direct to the stadium from Marylebone and less crowded. 29/7/2015 - Leigh-on-Sea to London Fenchurch Street and return. Went to see the show, Mama Mia in London for the evening. 9/8/2015 - Civitavecchia to Rome St Peters and return. On holiday on a cruise around the western Mediterranean. As part of our itinery we arranged to get a train from the port of Civitavecchia to Rome. It didn't go to the main station in Rome but to the smaller St Peter's Station, just around the corner from St Peter's Basillica. It was an old diesel unit of four cars called "The Roma Express" but still went quite fast and did the journey in around 45 minutes each way. Nicer than a coach! Another quiet month railway trip wise, but one different thing to end the month with. I went on a visit to the Colne Valley Railway near Braintree in Essex to try out the Day Out with Thomas Experience that they put on here. We went as a family with three different generations so my grandson could see the "real" Thomas who he likes so much. We all enjoyed the day and managed to go on four different trains as well as have something to eat in the buffet carriage. The only problem with the Colne Vlley Railway is that it is so short and it would be nice if they could extend the line at either end one day. Plus they seem to have several diesels there including 2001 just rusting away in a siding? with no track to run on. Went to Feltham with my work. Had a pleasant journey each way. Came back into Waterloo on one of the defunct HS1 lines into the old HS1 terminal which was interesting and good to see that they are finally making use of this white elephant which has laid dormant for several years. 18/10/15 - Newhaven Town to Newhaven Harbour and return. Visiting the Brighton area for the day, so made use of the half hourly service that exists on the Seaford branch to visit the remains of Newhaven Marine station. I got a train from Newhaven Town station which only goes about half a mile to Newhaven Harbour station. 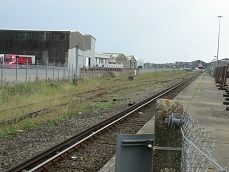 Then it's just a short walk past the signal box to the remains of Newhaven Marine station. Interestingly the station isn't completely closed yet as it still has a parliamentary train each day round about 8 o'clock each evening. Yet you can't buy a ticket to the station, nor catch this particular train. It still has its name board up, but the platform is cut off by a fence, though the line and third rail are still in place. The roof which was deeemed unsafe and the main reason for closing the station has now been removed and you can walk along this part. Though the office building by the platform which was the port terminal looks pretty derelict. I really don't know why Southern bother to send a parliamentary train into the station seeing as the ferry terminal and dock has been moved further up the quay nearer to Nwehaven Town station. Also Newhaven Harbour station itself seems pretty dead, so why not close that as well, seeing as Newhaven Town station is so close? 21/10/15 - Toddington to Cheltenham Racecourse and return. Toddington to Laverton and return. Made a welcome return to the Gloucester and Warwickshire Railway at Toddington whilst having a few days away in the Cotswolds. After last time's fiasco with the train breaking down, I'm pleased to say that everything went smoothly this time apart from the weather. It's good to see that the railway has got everything running smoothly again, after the two landslips they had. Plus it's good to see that the line has been extended north to Laverton and will eventually reach Broadway. Plus had a pleasant lunch in the Flag and Whistle cafe next to the station. Went to the 02 to see U2 in concert. Went to see Barnet play Blackpool in the FA Cup first round at the Hive in Edgware. Took agers to get there via the Metropolitan line from Aldgate with a change at Wembley Park onto the jubliee Line. 10/11/2015 Leigh-on-Sea to London Fenchurch Street. London Kings Cross to Northallerton. Had to go up to the North East with my work, staying overnight in Sunderland. 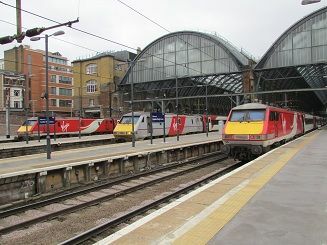 Interesting to see all the Virgin liveried trains at Kings Cross as it was my first visit to the station since they took over. Had a pleasant journey with no hold ups inspite of the problesm on the line less than 24 hours earlier. 11/11/2015 Northallerton to York. York to London Kings Cross. London Fenchurch Street to Leigh-on-Sea. On the way back had an hour in York, whilst I changed trains. Was amazed to see that the river had flooded afair part of Tork again, though no mention of this on the news. Also visited the National Railway Museum for a short while. Went to the 02 to see Simply Red in concert with my wife. The new timetable for C2c had just come into force and it meant getting one of the new trains that started from Leigh-on-Sea station. It was a tweleve car unit and in effect we had a whole train all to ourselves for much of the journey! 30/12/2015 - Sheffield Park to East Grinstead and return. Went away with my wife for a few days to the South Coast on a post-Christmas break. On our way back we went fpr a ride on the Bluebell Railway, which was running services in this first week after Christmas. It was well patronised with several steam engines running. The railway side of the day was very well run. The catering side was not. We were planning to have lunch at the cafe/pub at Sheffield Park when we got back, but it was so busy with not enough tables, plus they didn't cater for my wife, who is gluten-free, that we gave up and drove to East Grinstead for our lunch. What is needed is more catering at Sheffield Park. If it was this busy in December, heaven knows what it must be like in the height of summer!